Vicki Chu is 36 year resident of the City of Bellaire and a Broker Associate with Roger Martin Properties. Last night, she asked the Bellaire City Council to fix her sunken street. "I cut down two live oaks that were each sucking up 80 gallons of water a day, leading to subsidence around the trees. Debris and trash has been collecting in front of my house, and the street and driveway were both below grade." Many thanks to Bellaire Public Works Director Brant Gary who promised to look into the need for infrastructure maintenance. 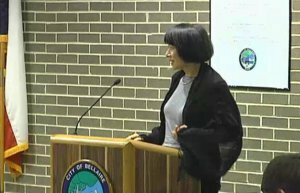 To view live, streaming videos of Bellaire City Council meetings, visit www.bellairetx.gov > Our Government > Meeting Agendas, Minutes & Videos and select the meeting date.